Here's a regional round-up of the 2015 Little Owl breeding season from five nest box projects. Many thanks to Vincent Cartwright, Robert Danson, Roy Leigh, Nigel Lewis and Bob Sheppard for their generous contribution towards this blog. Please submit your Little Owl nest records to the BTO's Nest Record Scheme. Nigel Lewis and his team have monitored Little Owl nest boxes across South Wiltshire for over 30 years. Their best ever breeding season was in 2000, with 22 Little Owl pairs nesting in their boxes. Since then, box occupancy has declined to less than 10 pairs in recent years. In 2015, the team monitored 12 Little Owl nests; nine pairs bred in boxes and they located three nests in trees. Clutch size ranged between one and five eggs, with a mean clutch size of 3.1 eggs. Four nests failed at the egg stage and two at the chick stage – the chicks were predated. 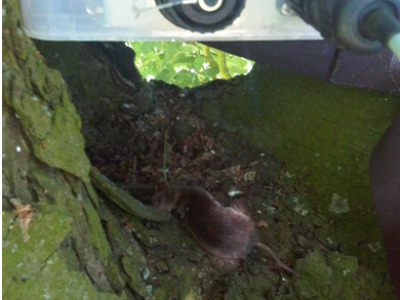 Emily Joáchim has recorded footage of intraguild predation of Little Owl chicks by a male Barn Owl (see here and here). Mean brood size at time of ringing was three chicks; 13 chicks were ringed (two more were inaccessible). The team will replace 20 Little Owl nest boxes this winter. They would like to carry out a survey for Little Owls in rural villages in South Wiltshire in 2016. Roy's an avid UK Little Owl supporter and has researched this owl’s breeding ecology in Cheshire. He's concerned by the loss of Little Owls at traditional breeding sites and reports that once he loses a pair at a breeding site, Little Owls will rarely use that site again. This year, no Little Owls bred in Roy’s boxes but he managed to locate five nests in natural cavities within trees. Roy was able to access two of these nests and ringed three chicks at both sites. 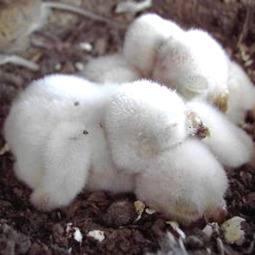 The other three sites were less productive, with two broods of two owlets and a brood of one. Roy recently launched his Little Owl and Orchards Project - he's currently installing nest boxes in orchards, and has started an ageing nestling Little Owl study, which you can read about here. Robert monitors natural sites and 64 nest boxes for Little Owls in Lancashire – they started to use his boxes regularly from 1990, after he made a new box design with a tunnel. His best ever Little Owl breeding season was in 2003 – he monitored 27 nests. In recent years, numbers of Little Owls have declined and in 2014, only seven pairs bred in his boxes. In 2015, Robert reported that ‘the Little Owl has made a much hope for improvement this year with 16 nesting pairs’. Clutch size ranged between two and five eggs and mean clutch size was 3.8. Thirty six chicks were ringed, with one brood of five and two broods of four – mean brood size was 2.8 chicks. Three nests failed, two of which Robert believes could have been predated by Stoats. This year’s results matched the 2011 breeding season. Fourteen and 13 pairs bred in Robert’s study area in 2012 and 2013, respectively. Robert is currently building 15 new Little Owl nest boxes. Bob and Alan have installed 250 Little Owl nest boxes in Lincolnshire and have monitored Little Owl nests for over 30 years. Over the last decade, box occupancy by Little Owls has significantly increased, with at least 59 nesting attempts per annum since 2011. They described 2015 as ‘an average sort of year for the Little Owl’ in Lincolnshire. Seventy pairs bred in their boxes; 49 nesting attempts were successful, 108 chicks were ringed and mean brood size was 2.5 chicks. Bob and Alan were pleased with this occupancy result as there was a small mammal population crash in spring. Their best ever breeding season was in 2014 with 80 Little Owl pairs nesting in their boxes and 188 chicks ringed. In addition to nest monitoring, Bob and Alan have been running a Retrapping Adults for Survival (RAS) project on Little Owls since 2006, which you can read about on page 15 here. 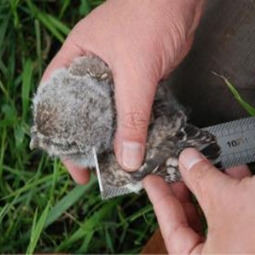 In 2015, they ringed/retrapped 47 breeding females and ringed an adult male Little Owl. Finally, a Little Owl call-back study was carried out in Lincolnshire in March 2015; this was in collaboration with the BTO. Vincent and Gary have monitored Little Owl nests in Oxfordshire since 1995 - here's their 2015 report: It was a mixed season in Oxfordshire with lower than average nest box occupancy and some sites suffering from predation. Little Owls bred in 14 of our boxes and in two natural sites, with successful breeding recorded at 11 sites. Clutch size ranged between one and four eggs; the mean clutch size was 2.8 eggs. At one site, a brood of four young was predated by a Grey Squirrel. At another site, a Tawny Owl nesting below a box took an adult male Little Owl causing the female of this pair to wisely decide that discretion is the better course of valour, and she abandoned her clutch of three eggs. At the third failed site, the remains of an adult female Little Owl were found in the nest box having been killed and eaten whilst incubating, presumably by a Stoat or Weasel (see below photo). Interestingly, her clutch of three eggs was left untouched. Mean brood size was 1.9 chicks. We ringed 21 chicks and six breeding adults, which were also fitted with a PIT tag as part of a wider study using data logging equipment. We've fitted PIT tags to most of the adult Little Owls in our project and we’re collecting data on pairing and nest site fidelity. 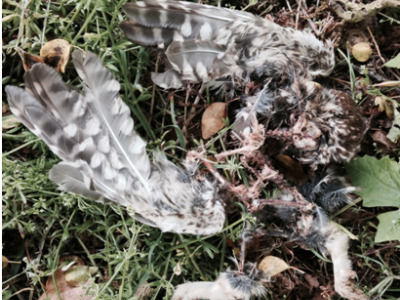 Remains of predated female Little Owl found in nest box. Little Owl food larder under a PIT tag data logger.